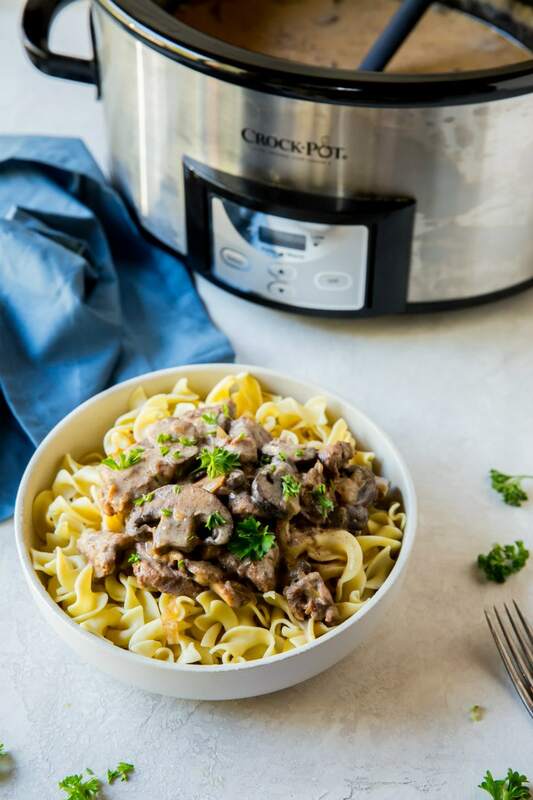 This lightened- up Slow Cooker Beef Stroganoff is super simple to make. Let your slow cooker do the work for you and dinner will be done in 6 hours! This is one of those super easy no-brainer slow cooker recipes. All of the ingredients just get dumped into the slow cooker and it’s set to simmer for several hours. 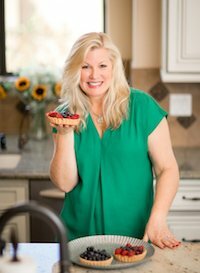 This recipe has been a family friendly, favorite recipe for many years at my house. It’s pure comfort food! Stroganoff has Russian roots. 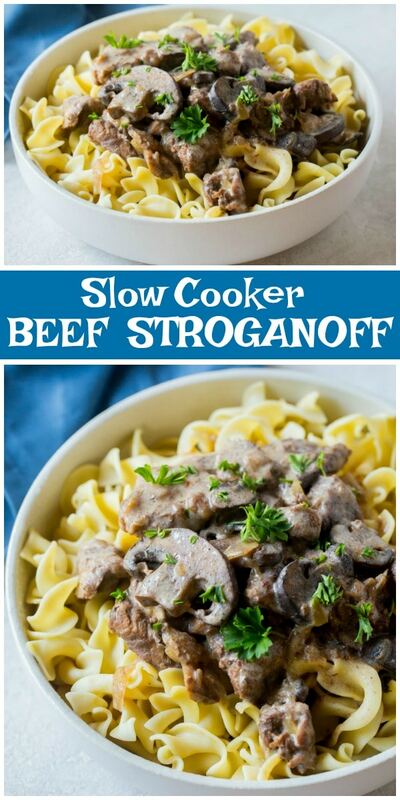 A stroganoff is typically characterized as a meat dish with a sour cream based sauce. Its origins date back to mid 19th century Russia. 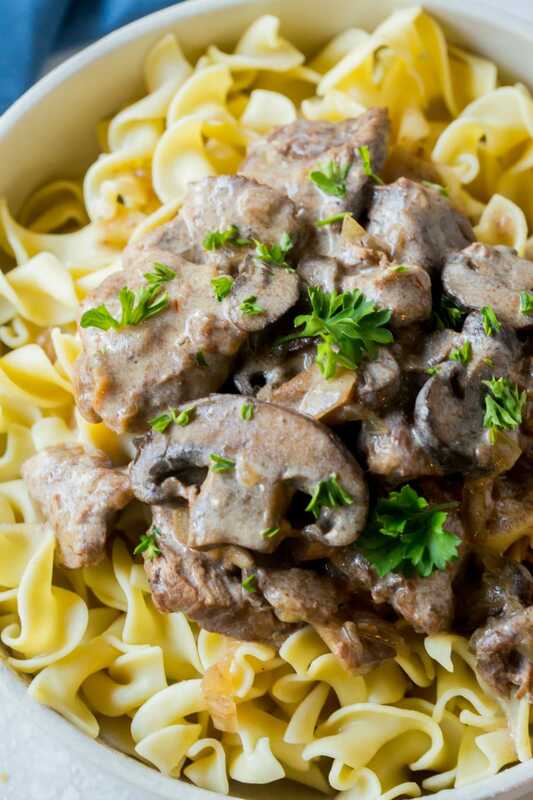 Stroganoffs are now popular all over the world, and recipes vary greatly. 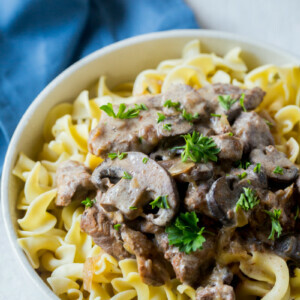 Be sure to check out my lightened-up Chicken Stroganoff recipe, which is also worth trying. Chunks of beef, mushrooms and a handful of other ingredients are placed into your slow cooker. You’ll set the timer for 4 hours on high or 6 hours on low. I feel like cooking it on low will give you a more tender meat. Trying to rush things by using the high setting on a slow cooker doesn’t always work out quite as well. When you’re just about ready for dinner, you’re going to mix up the stuff that’s going to make it a “stroganoff.” In this case, that will be reduced-fat sour cream, cornstarch, soy sauce and salt/pepper. 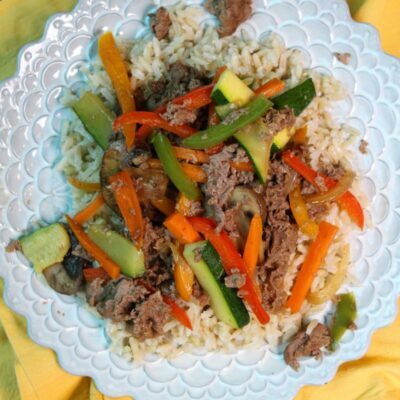 You’ll stir it into the hot, cooked beef mixture and let the slow cooker thicken up the sauce for about 30 minutes while you make the base for your stroganoff: egg noodles, whole wheat pasta, rice, cauliflower rice, or whatever you prefer. And then you’ll have this! I love that this cooks while I’m getting on with a busy day of work and errands. When I get home, I have time to finish the sauce and cook the noodles while my boys clean up for dinner. It’s good, hearty comfort food. 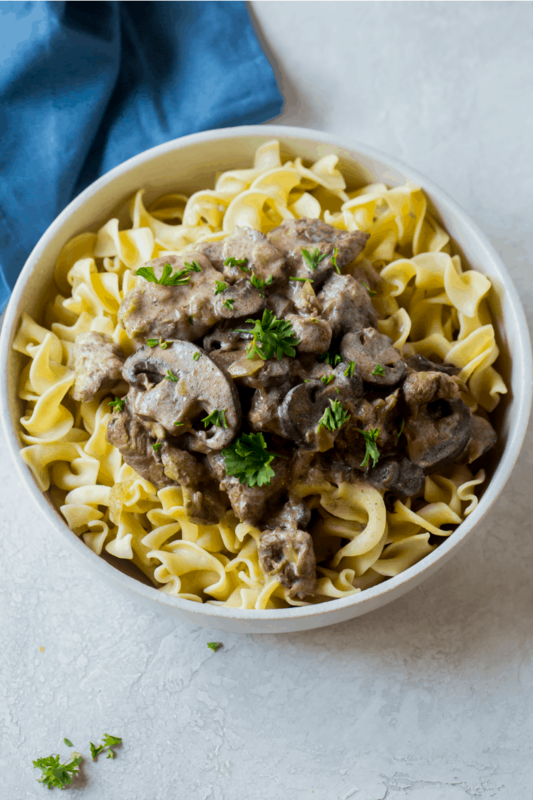 A typical beef stroganoff has a pretty creamy, heavy sauce. 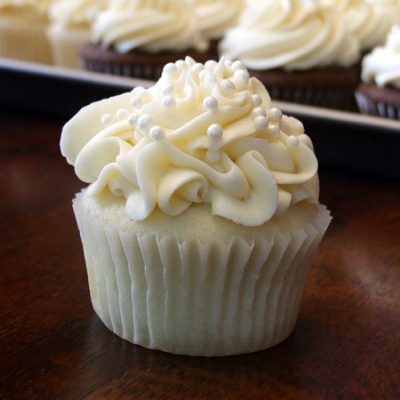 This one is lightened up by using reduced fat sour cream. The sauce is thinner than a classic stroganoff sour cream sauce. To me, it’s perfect. I don’t need all of that extra fat for dinner! What’s the best kind of beef to use for the slow cooker? Any kind of chuck roast or chuck steak will work well for this recipe. Just cut it into pretty evenly cut chunks, and it will all cook nice and even and turn out a tender meat for you. 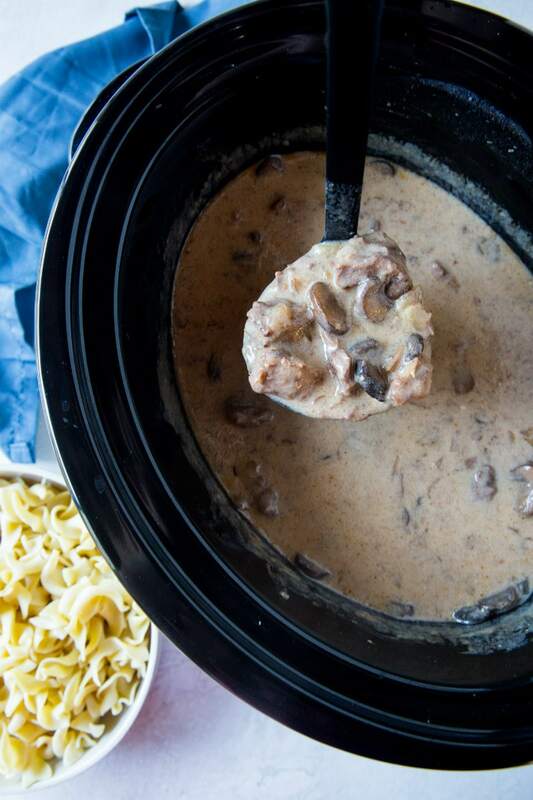 Can you freeze Beef Stroganoff? Yes! 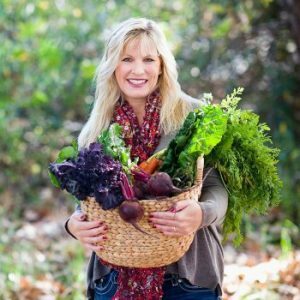 Freeze leftovers in a large freezer zip baggie or plastic tub for up to 3 months. Defrost and re-heat when ready to eat. It should work out just fine. Beef Stroganoff lightened up a little bit! Combine the beef, mushrooms, onions, tomato paste, broth, wine and 3 tablespoons soy sauce in the bowl of a slow cooker. Cover and cook on HIGH for 4 hours or on LOW for 6 hours, or until beef is tender. In a small bowl, stir together the sour cream, remaining 1 tablespoon soy sauce, cornstarch and black pepper; whisk into the hot meat mixture and cook an additional 30 minutes or until sauce has thickened slightly. 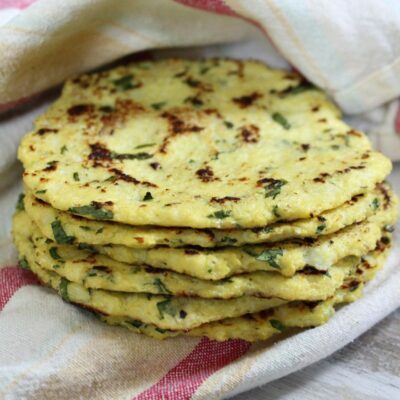 Serve over pasta or rice and garnish with parsley, if using. 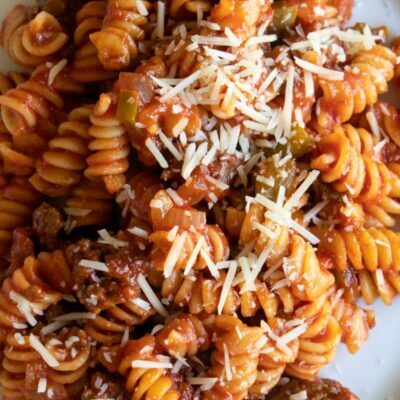 Nutritional information is for the meat mixture only- not the pasta or rice that it's served over. 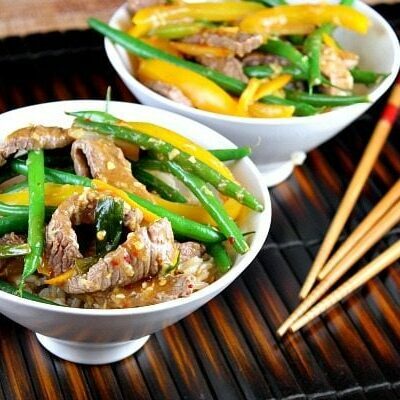 To prepare this recipe as GLUTEN FREE, be sure to use GF beef broth and soy sauce, and serve over GF pasta or rice. 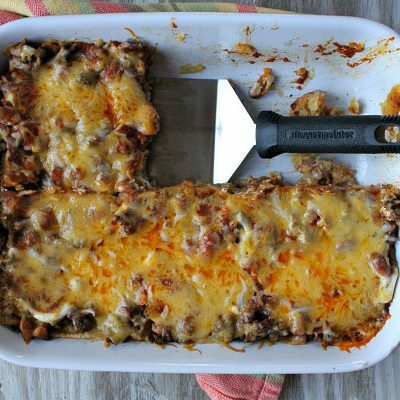 This recipe was originally shared in 2011. It was edited and re-published in 2019. Since when is chuck roast lean?? It’s one of the most fatty cuts out there. 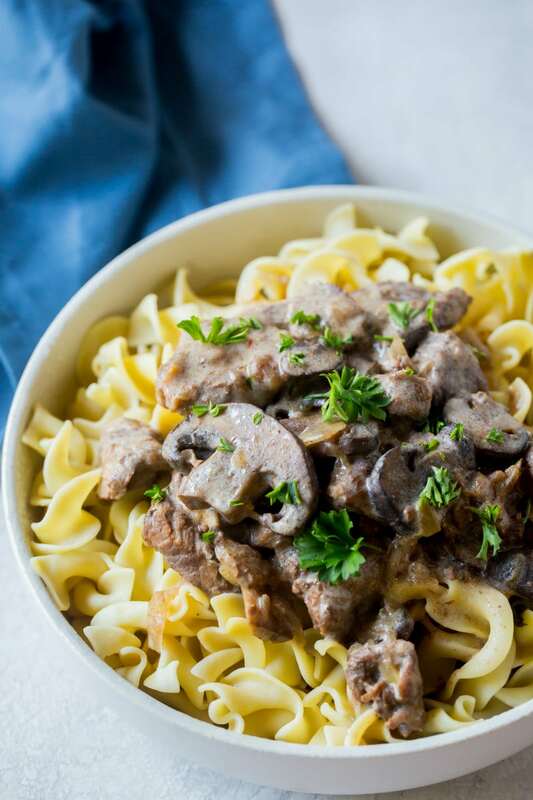 The meat isn’t lean– the sauce is lightened up from the classic stroganoff. two thumbs up!! Husband said best stroganoff I’ve ever made!! I did omit the white wine though.